This is a My Favorite Things s tamp set that I just love. I had gotten a box of thank you cards at a garage sale and decided to make some cards with them. The cards were very thin so I ended up cutting white card stock for the base, but at least I have the envies! I got the patterned paper from a LSS here in town last fall. I stamped the image on cream colored card stock then on a patterned paper for the dress and then on white and colored with Stampin Up markers for the arms and cup. 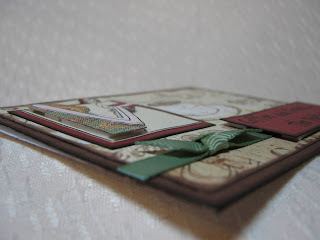 The ribbon is Stampin Up mellow moss. Here you can see the dimension a bit better where I pop dotted the sentiment and also the lady. The card itself measures 4.5 x 3.5 inches so there wasn't a lot of room to play with. Over all I like it though. love this card! it is absolutely fabulous and all the colors, as well as the dimension, are perfect! hugs! I left something for you on my blog. I hope you stop by soon to pick it up! 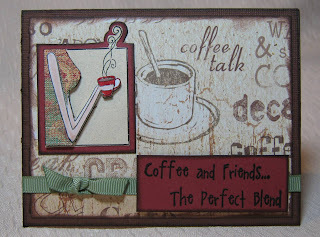 Cute card - Thanks for sharing!